In the interim, however, subdivisions were built along and on top of the former channel and remaining oxbows of the straightened section of Buffalo Bayou in what is now Terry Hershey Park, now owned by the flood control district. A great many homes flooded in these subdivisions, along with other residences up and down the bayou. 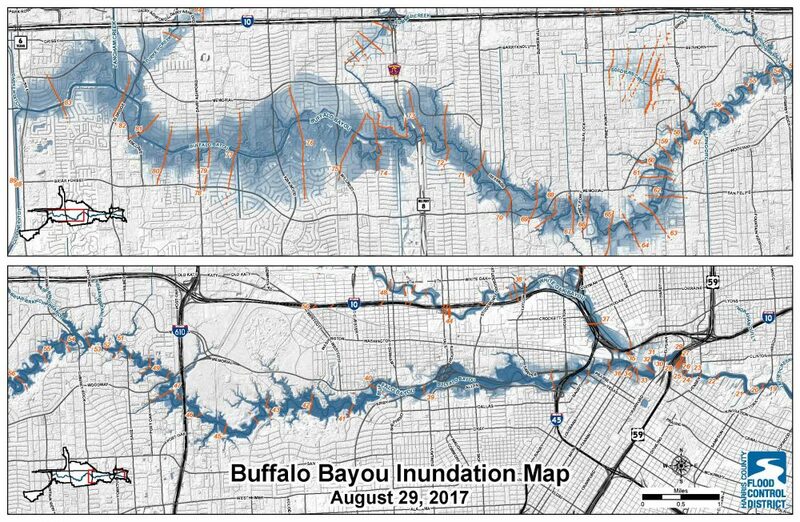 Harris County Flood Control District projection of flooding along Buffalo Bayou on Aug. 29, 2017, following releases of stormwater from the federal dams. Note that this is a map of flooding from the opening of the floodgates Aug. 28 after the initial peak of Harvey flooding had passed downstream on Aug. 27. 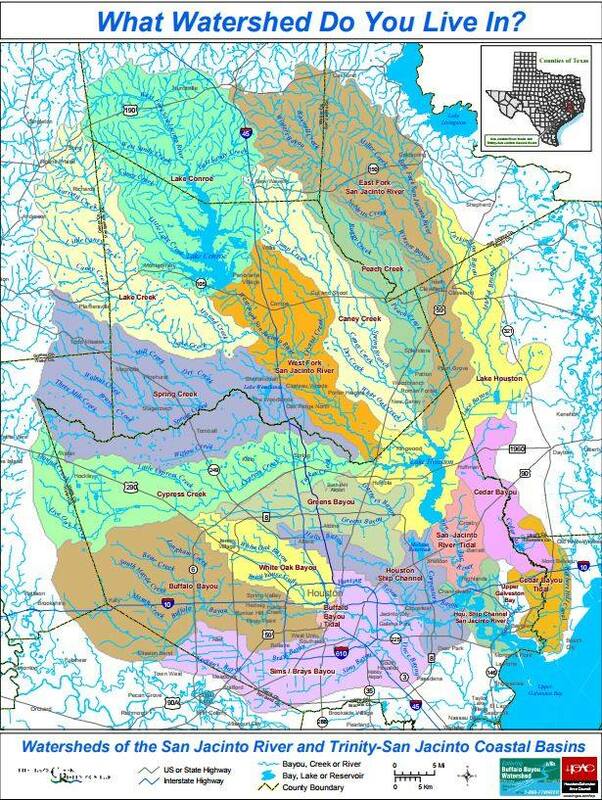 Compare this map of flooding on the straightened artificial channel above Beltway 8 with the above map of the original meanders. These figures do not include apartments, condominiums, commercial or other structures that flooded. Buffalo Bayou flows through Barker Reservoir. 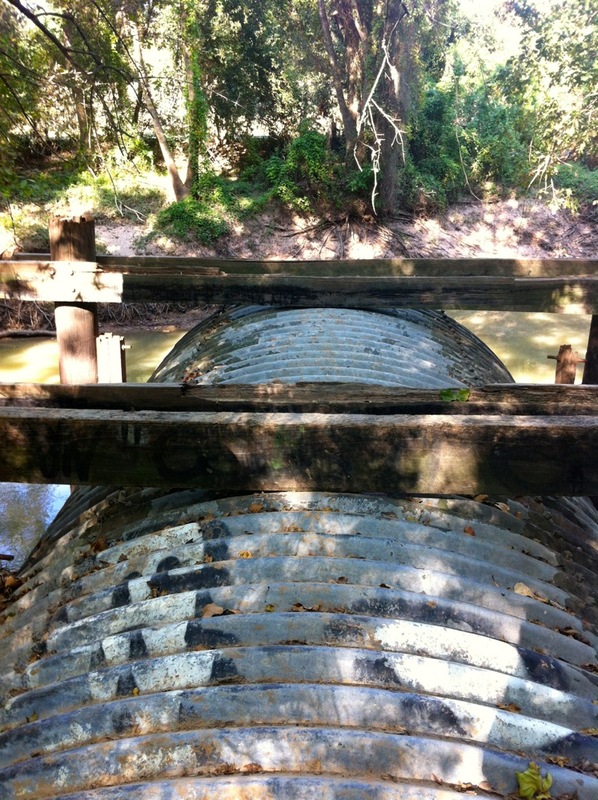 Other streams flowing through and around Barker and Addicks reservoirs also empty into Buffalo Bayou, as well as numerous major and minor tributaries downstream of the dams. 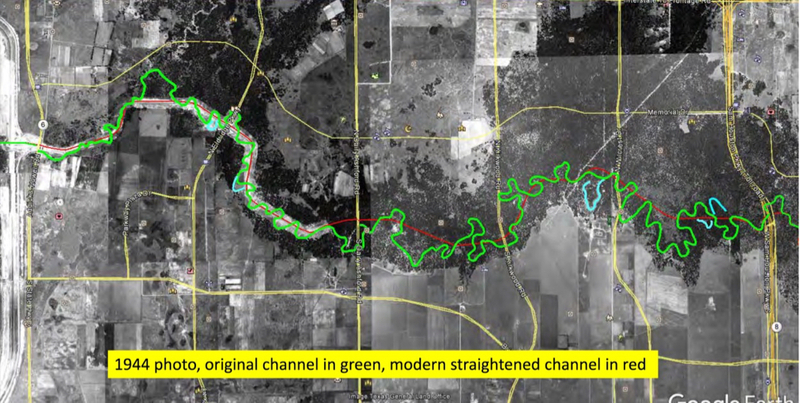 Though Huffmaster, whose house flooded on a remnant oxbow of the bayou adjacent to Terry Hershey Park, claims in his proposal that “east of Piney Point, few structures flooded even at 16000 cfs [cubic feet per second],” (p. 15) anecdotal reports from residents downstream are that entire neighborhoods had anywhere from a foot to as much as eight feet of water in their homes all the way to Shepherd Bridge. Residents upstream and downstream describe the peak of the Harvey flooding beginning the morning of Sunday, Aug. 27, and passing that evening downstream. However, in response to the unprecedented amount of rain runoff flowing into the reservoirs, the Corps of Engineers was forced to begin controlled releases from the dams around 1 a.m. Monday, Aug. 28. This precipitated a second wave of flooding primarily hitting those upstream neighborhoods closer to the dams, including some that hadn’t flooded earlier. Many of those devastated neighborhoods, as well as neighborhoods all over the county, are still attempting to recover even as voters go to the polls. However, scientists expect such storms to increase in intensity and frequency. The list of projects, while including some new detention proposals, emphasizes “improving” channels for stormwater conveyance, which means more and faster water flowing through channels and into the overburdened reservoirs, for example. Still included is $10 million for a controversial plan to remove forest and dig a series of small linear detention basins on the south side of Buffalo Bayou in Terry Hershey Park. 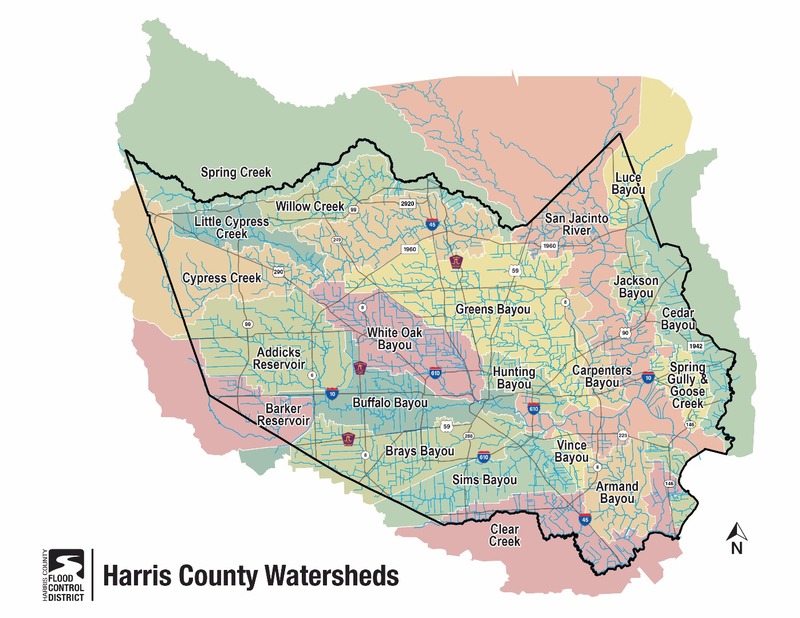 These basins would temporarily capture overflow from the bayou in order to balance increased flow into the bayou from future City of Houston drainage projects. Trees and vegetation, however, have important detention functions of their own, not to mention other important environmental and health benefits. Flooding begins on the land, and modern flood management focuses on stopping and slowing stormwater before it floods a stream. “Lag time” is the amount of time it takes for peak rainfall to hit the ground and run over the land (and through drainage pipes) into a stream. The shorter the lag time, the higher the peak flow in the stream. The list also includes funds proposed to be used in collaboration with Army Corps of Engineers, which owns and operates Addicks and Barker, to evaluate the effectiveness and operation of those 70-year-old dams. Click here for voter information. Find out more about how the proceeds from the proposed sale of bonds might be used.